A first-of-its-kind initiative between the United States Coast Guard and Lake Carriers’ Association has had MH-65 Dolphins and MH-60 Jayhawks whirring above Interlake Steamship Company vessels since May. The rescue exercises, intended to simulate real-life medical evacuations, are the result of a joint agreement between the two maritime organizations which became official Oct. 31, 2017. 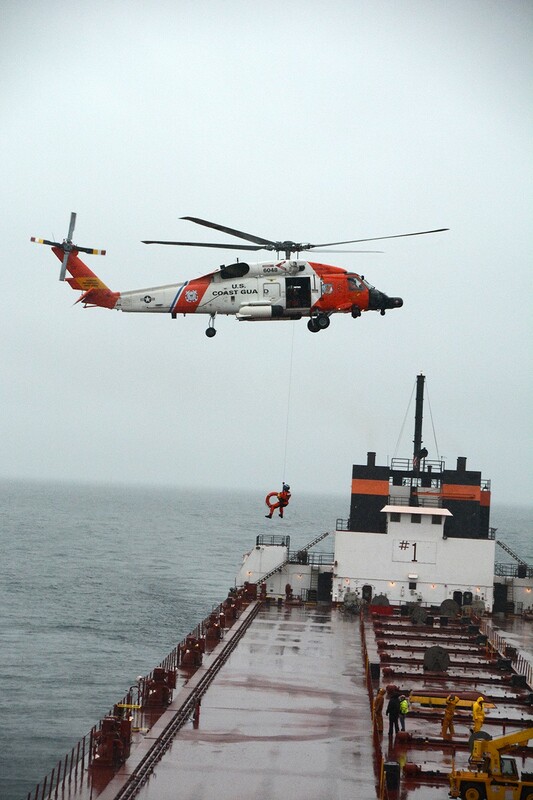 Training with the USCG Air Stations in Detroit and Traverse City has been a great opportunity for both the Coast Guard crews and Interlake’s shipboard crews, says Paul Christensen, director of operations and security at Interlake, the largest privately held U.S. Flag-fleet on the Great Lakes. James H.I. 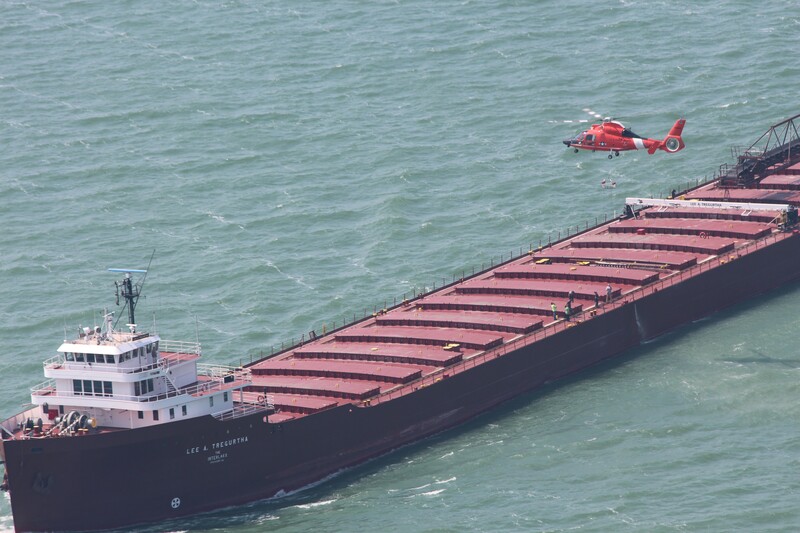 Weakley, president of Lake Carriers’ Association, the industry group that represents U.S. flagged vessels on the Great Lakes, says he was pleased to formalize the program with the Coast Guard and “get it off the ground”. Capt. Steve Hughes is master of Interlake’s 826-foot M/V Lee A. Tregurtha, one of the vessels that has participated in a handful of hoist exercises on Lake Huron this season. He says the training is very relevant to what might happen on a bulk carrier moving cargo nonstop from March to January. Participating in these exercises has also been a welcome break in the day-to-day routine for his crew of nearly two dozen mariners. “They also understand that there is the very real possibility that this training may be put to good use in the future, so the incentive was there to get as much out of it as possible,” Hughes says. We spoke with the operations officers at both Air Station Detroit and Air Station Traverse City to see how training has been going on their end and to find out exactly what happens during a simulated rescue mission. What are the goals of the training initiative? Cmdr. Breanna L. Knutson, chief pilot and operations officer at Air Station Detroit: There are many benefits to these trainings such as training boat crews, familiarizing helicopter crews with different types of vessels, and bolstering the working relationships between the Coast Guard and the Great Lakes maritime community. Perhaps our most essential goal though is, practicing real-world scenarios so that we can respond in the most efficient and safe fashion. Cmdr. Robert J. Donnell, operations officer at Air Station Traverse City: There is a lot of value with being able to train, talk to the crews on the Lakers and then go out and teach their crews how to tend devices under relatively controlled conditions. It’s good for your crews and our crews and things are that much safer because of the familiarity with our procedures, how we're going to communicate and what we're going to ask for when we arrive on scene. How do you determine what vessels will train with your crews? Cmdr. Robert J. Donnell: I never realized how dynamic the boat schedules were so what we end up doing is using Boat Nerd or Marine Traffic and we look to see where the Interlake Steamship vessels are and if there is one close, we call the ship and say, "Hey, we've got the ability to come out today, you're relatively close, would you be up for doing a couple of training hoists?" So we just call the day of, based on their location, proximity to the Air Station, and we go out and meet up. What happens during a typical training session? Cmdr. 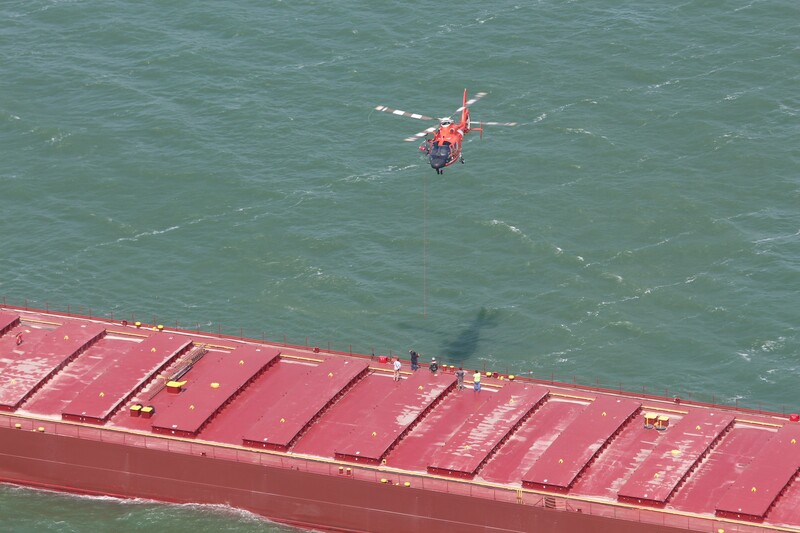 Breanna L. Knutson: The helicopter arrives on scene, gets in contact with the vessel, and runs through an operational hoist device delivery and recovery brief, essentially how the crew expects the training scenario to progress and coupled with safety considerations. The 4-person crew in the helicopter identifies a spot to where they can safely hover over the vessel. The helicopter then repeatedly lowers and recovers a rescue device (typically a basket) to the deck of the vessel. The Rescue Swimmer is often lowered down first to aid the crew and provide instruction as to what to expect and how to safely manipulate the rescue device. There are two pilots (a flying pilot and a safety pilot), a flight mechanic, and a rescue swimmer. The Flight Mechanic acts as the hoist operator. They give directions to the flying pilot to move the helicopter into a prime hoisting position. At the same time, they are managing the controls for the hoist and ensuring the device on the end of the hook does not dangerously swing around while being delivered. All this is done while the ship is underway. What kind of time and distance is involved in a single training session? Cmdr. Robert J. Donnell: We've transited as far as about 120 miles from here (Traverse City), so about an hour of transit and then we hoist for maybe 30 or 40 minutes and then an hour back. Cmdr. Breanna L. Knutson: The majority (of hoist exercises) take place in southern Lake Huron and western Lake Erie. How do you think these sessions will potentially improve response and outcomes in true emergencies? Cmdr. Robert J. Donnell: This is very realistic training. For our crews, especially our junior pilots, junior flight mechanics, it's a great opportunity to go out and train with a vessel that we could expect to see operationally and encounter for a real medevac under nighttime conditions or in stormy weather. In the at least 9 occasions we have conducted hoisting the Lakers, 2/3 of our pilots, more than half of our rescue swimmers, and about 1/3 of our flight mechanics have had the opportunity to conduct training. Cmdr. 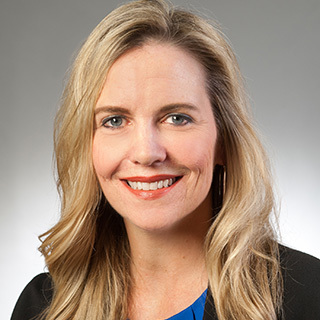 Breanna L. Knutson: Training with the larger lake carrier vessels and their crews gives our personnel the chance to practice realistic scenarios on the platforms we'd most likely encounter on a case such as a medevac. Taking time to find the best location to lower the Rescue Swimmer down now can save precious time when someone's life is on the line later on.